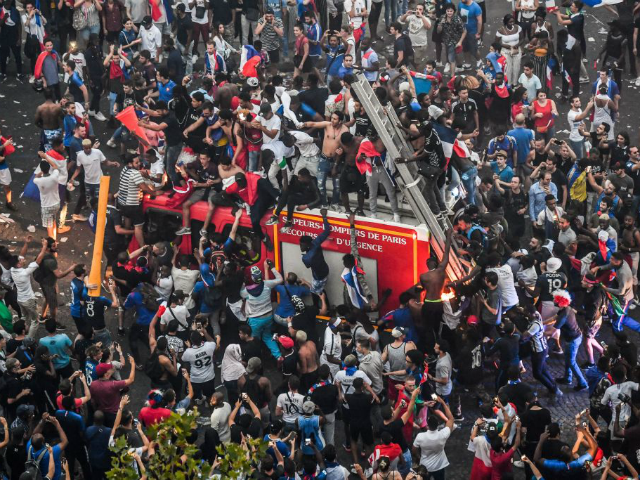 As many as a million people had been enjoying the “good-natured atmosphere” at an event on the Champs-Élysées in Paris following France’s 4-2 win against Croatia, which ministers had hoped would bring a “great moment” of “national unity”. But by 11 pm the jubilant mood had turned to chaos, with what local media describes as “bands of thugs” launching projectiles including bottles at police, who responded by firing tear gas while the area was evacuated. Ordinary football fans fled the streets when violence first broke out earlier in the evening, with troublemakers even launching empty glass bottles at families with children, according to Le Figaro, which reported that scenes of vandalism and looting broke out including a kiosk set alight and the destruction of numerous cars. A large number of unverified images and videos emerged on social media, including those appearing to show ski mask-clad individuals breaking into a drugstore and leaving with wine and champagne — with a police source estimating up to 150 people were involved in the break-in — while elsewhere in the centre of Paris a supermarket was pillaged and a restaurant and its customers attacked. “What is the f****** goal of this?” he said, remarking that whether “win or lose”, there’s “not a minute of respite” in France now from riots and violent behaviour. In the eastern city of Lyon, meanwhile, authorities reported Monday morning that 11 police officers had been wounded and 30 people arrested from clashes, after hundreds of rioters rampaged through the streets, setting fire to trash cans, attacking cars, and smashing into shops including department store Printemps, glassware retailer Baccarat, and Lacoste. One video from the night showed thieves emerging from the sportswear shop with stolen clothing. سرقه محلات لوكوست بعد فوز فرنسا بكاس العالم ضمن اعمال الشغب في ليون . Hours before the World Cup final, education minister Jean-Michel Blanquer asserted that France “has much more national cohesion than we would admit”, predicting that victory at the tournament will allow the nation to show “we are a great country that can unite under great circumstances”. Speaking on Europe1, the minister said that the demographics of France’s national team, with the majority of its players from an African background, “highlights good news” that “we don’t often recognise”.